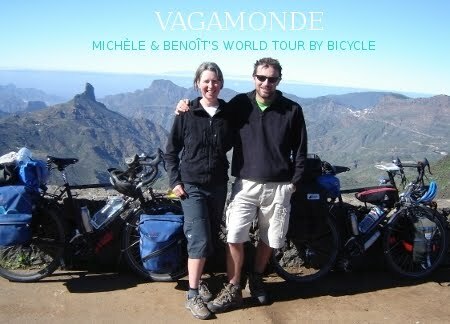 Our book Vagamonde: Chasing Euphoria and Getting Hit by Reality is now available in English on Amazon.com, Amazon.co.uk, Amazon.fr,Amazon.de, Amazon.it, and Amazon.es. Update as of January 7, 2014: our book is now available on Amazon.ca. Having hoped for a more relaxed and carefree lifestyle, we quickly learned the hardships of long-term travel. To cope with this, we started documenting the trip in this blog. We just finished writing a book that enhances our blog with more stories, drawings, hand-drawn maps and chapters of the long preparation and the reintegration back into so-called normal life in Canada.